How strong is your mixed drink or cocktail? Depending on the recipe, you can have one, two, or more U.S. standard drinks (also known as alcoholic drink-equivalents) in one cocktail or mixed drink. Click on the alcoholic beverages below to see the results for some popular recipes from bartender’s guides. Be aware, though, that different bars, restaurants, and people often make them somewhat differently. For beverages not shown, try “Check your drink” (see tips, below). in 0 total fluid ounces. How often you drink matters, too. To pace yourself, have no more than one standard drink (also known as an alcoholic drink-equivalent) per hour, with nonalcoholic "drink spacers" between alcohol beverages. 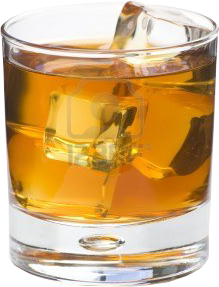 Note that it takes about 2 hours for the adult body to completely break down a single drink. Stay within low-risk levels: For men, no more than 4 standard drinks on any day (and 14 per week), and for women, no more than 3 on any day (and 7 per week). For drinks not included above, try the "Check your drink" option. Search online for your drink recipe, if need be. Enter the ingredients and amounts using the drop-down menus or the "+ Add it" feature. Also enter the percent alcohol by volume (% alc/vol) for the alcohol ingredients. The % alc/vol, which is half the "proof," can be found on distilled spirits bottle labels or online. If you want to estimate the "strength" or overall alcohol content of the drink, be sure to enter the nonalcohol ingredients, including water or melted ice consumed with the drink. Disclaimer: This calculator is for educational purposes only, to show how the number of standard drinks (or alcoholic drink-equivalents) and the alcohol content (% alc/vol) of a cocktail can vary depending on the type of spirits and the recipe. Any differences between the data you enter in the calculator and the actual amount in a drink could significantly affect the accuracy of the estimates. Because of this and individual variations in alcohol sensitivity and metabolism, the calculator should not be relied upon to predict blood alcohol level or any other measure. Do not drink if you are under the legal age (21 in the United States), and do not drive or engage in other potentially dangerous activities after drinking.